As we were working on the projects for this issue, a few things came up that we thought would be nice to include. Since there never seems to be enough room in the articles for the projects, we gathered together some of these tips for this page. There are a couple of wood species that can make the job a little easier. Poplar would be my first choice. It's relatively inexpensive (so your wallet doesn't hurt so much if you blow a cut). Also, it's light in color so the marked lines are easier to see. The key thing, however, is that Poplar is just hard (dense) enough to offer a good feel with hand tools. Yet, not so hard that you have to struggle just to make the cuts and chisel out the waste. By all means, stay away from Hard Maple. 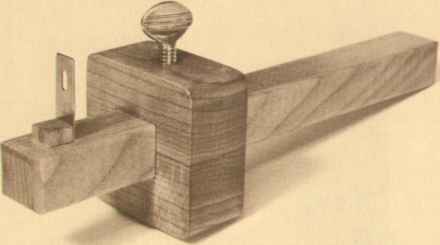 My first attempt to cut dovetails was in Maple — an event I'll always remember. As we were building the Contemporary Coffee Table shown in this issue, one of the biggest problems we had was coming up with a drawer-stop system. As mentioned in the article, we finally came up with a system using bullet catches. As shown in the drawing, the catch is basically just a little chunk of V2" dowel with a round-head screw and a spring from a ball-point pen. Although we used this catch on drawers, the most common application is on the doors of a cabinet. To make it, I drilled a !/<" counterbore in the end of a 3" long dowrel. (It's easier to work with this length to start.) Then I switched to a %2" bit for the pilot hole. Next, the dowel was chucked in the drill press and I used a file to round off the end. Finally. I cut the V2" long bullet off the end of the dowel. The bullet is mounted by drilling a W hole in the project. When drilling the mounting hole, be sure to allow enough room for the compressed spring (experiment a little on some scrap wood). If this catch were mounted in a door, you'd have to drill a shallow dish-shaped hole to trap the bullet as the door is closed. I'm always amazed at what you can learn by reading the labels on cans — especially on cans of finishing products. I guess I never expect to see anything but the usual "Stir well before using." As you've probably noticed in the past issues of Woodsmith, one of my favorite finishes is Watco Danish Oil Finish. Without going into all the advantages and disadvantages of this product, I'd like to mention one of the finishing techniques we use to finish projects joined with dovetails — and why Watco oil is so helpful. Very few woodworkers can cut perfect dovetails every time. There are bound to be small voids no matter how hard we try. Naturally, these voids must be filled — hopefully in a way that doesn't scream "That joint was filled!" The solution to this problem is right on the back of the Watco can. It says, in part, "Apply a liberal amount of Wratco oil with a brush, roller or cloth. While the surface is still wet with Watco oil, wet sand with 600 wet or dry sandpaper. Wipe dry. After one hour, apply a second application of Watco oil allowing 15 minutes penetration. Then wipe completely dry." Not only did they manage to mention the name Watco three times in four sentences, but they offered a nice finishing tip. After reading this, I couldn't resist experimenting a little bit. What I came up with is this. Apply a liberal amount of oil (just like they say) then sand with 220 grit (instead of 600) silicon carbide (Wet-or-Dry) sandpaper. As you sand you'll create kind of a goopy mess of sawdust and oil. Keep sanding and adding oil until there's enough of this goop to fill in the voids in the dovetails. This sawdust/oil mixture will dry very hard, and it almost perfectly matches the end grain of the pins and tails. It takes a keen eye to see that the joint was filled at all. I've been using this technique for about three years now, and it works beautifully. It's especially nice on open-grained wood (like oak or walnut) because the 'goop' acts as a wood filler to fill the pores as well as voids in the dovetails. 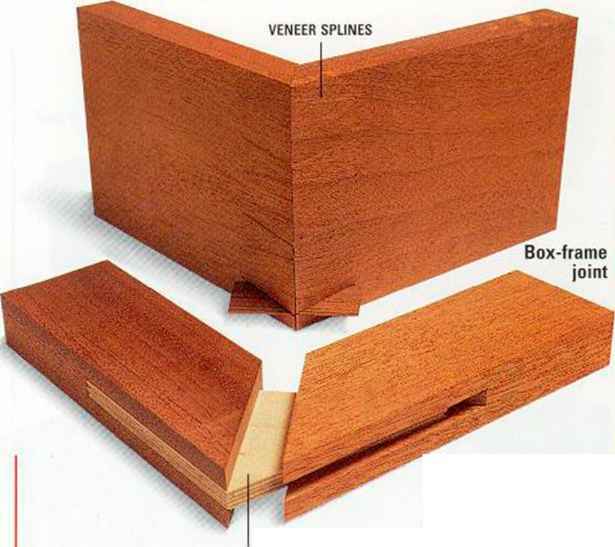 When laying out dovetails, there are several ways to mark the base line for the pins and tails. But the best way is with a marking gauge. It makes a nice crisp line right where you want it. We have four or five marking gauges in the shop. One is a nice new $40 rosewood and brass 'store-bought' model. I'm also very fortunate to have the marking gauge my grandfather used during his life as a cabinetmaker. This hand-me-down is not very fancy, but it taught me a lesson worth more than the 40 bucks I spent on the 'store-bought' one. The pin on the $40 model is sharpened just like the point of a pencil. When you mark a line with it, the point tears the wood producing a rather jagged line. knife edge (in fact, you can still see the file marks on the arm). This shape slices the fibers of the wood, producing a smooth crisp line. I may be prejudiced, but I reshaped my $40 gauge the same way and I'm much happier with its performance.